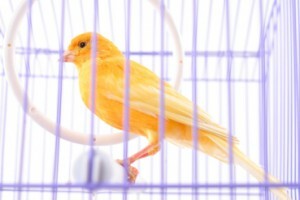 A century ago, coal miners relied on a caged canary as an early warning device. Canaries are highly sensitive to toxic gases and would take ill from noxious leaks long before the miners would notice otherwise. As long as the canary kept singing, the miners figured the air was safe. When the bird went silent, the workers knew it was time to get out. Bob Landaas refers to the yield on the 10-year U.S. Treasury note as the “canary in the coal mine” – an expression that the president of Landaas & Company repeated recently at an annual investment outlook seminar. To put today’s 10-year Treasury yield in perspective, the monthly average for the past 20 years was 5.3%. Since 1962, it was 6.8%. Given the size of the U.S. deficits, the depressed level of tax receipts, and people’s fears about inflation, you’d expect investors to shy away from Treasury bonds or at least be demanding higher yields. 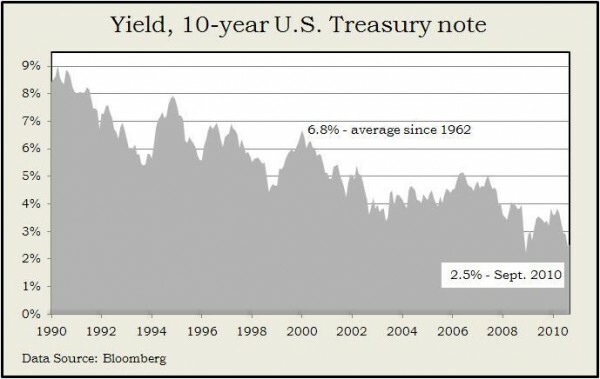 If the U.S. had an incurable debt problem and investors around the world lacked confidence in the government’s ability to pay, the 10-year Treasury would be far above recent yields because investors would demand them to be compensated for the risks they are taking. But this has not been the case. Strong demand for the U.S. notes and the safety they entail have been keeping the yields low. However, when investors’ moods change and demand becomes slack, yields will rise. If investors around the world feared inflation in the U.S., that too would require higher yield on the 10-year Treasury. But bond investors – investment technicians most in tune with inflation – are anticipating a 1.8% inflation rate over the next 10 years, according to the recent yields on 10-year Treasury Inflation-Protected Securities. That compares to an average annual increase of 3.4% in the Consumer Price Index, dating back to 1914. The continued appetite by global investors for U.S. Treasury bonds only partly explains why the yield on the 10-year has been so low: They also have been the target of strategic investing by U.S. Federal Reserve. During an August meeting in Jackson Hole, Wyoming, Federal Reserve Chairman Ben Bernanke said the central bank was committed to keep buying the 10-year Treasury with proceeds from its mortgage portfolio. As of Sept. 30, the Fed held nearly $1.1 trillion in mortgage-backed securities. But with many homeowners refinancing mortgages for lower interest rates, much of the Fed’s mortgage-backed investments have been replaced with cash. By reinvesting that cash into the 10-year Treasury, the Fed can influence long-term interest rates, maintaining its monetary policy to keep yields low. The scenarios that have been keeping yields low will not always exist. At some point, global investors may become concerned with the level of U.S. debt and policies fostering inflation. Meanwhile, the Fed may no longer see the need to buy 10-year Treasuries and begin paring back its purchases. Just as canaries had done for coal miners, the 10-year Treasury yield serves as an early-warning signal to investors. Currently, the canary in the bond market is still singing, and the 10-year Treasury hovers at historically low yields. When the canary’s song stops and the 10-year yield rises, think like the miners – be alert, be nimble, and pay attention to the bond market signals. With a well-balanced, diversified investment portfolio, you should feel no panic to rush for the exits. But at least you’ll be attuned to a change in conditions. Adam Baley is an investment advisor at Landaas & Company and registered representative and registered paraplanner.